I'm back from a lengthy road trip to Ohio, and while I was there I couldn't help but think about how influential Cleveland has been on my musical development. I spent my teenage years listening to WMMS which, for a long time was regarded as the number one “progressive rock” station in the country. DJ's like Kid Leo, Matt the Cat, Denny Sanders, Betty Korvan and Len “Boom Boom” Goldberg seemed free to play whatever piqued their interest. And during those formative years, many artists seemed to genuinely embrace Cleveland with the same enthusiasm with which the city embraced them. One such musician was Ian Hunter, originally the lead singer in the British band, Mott the Hoople. In 1975, Hunter released a self-titled solo album that got an enormous amount of airplay in Cleveland. The song “Once Bitten, Twice Shy” was a big hit — probably nowhere outside of Cleveland — but I remember Hunter (along with ex-David Bowie Spiders From Mars guitarist Mick Ronson) playing Cleveland three times in one month and each time they performed, the venue got bigger and bigger. Very unusual. 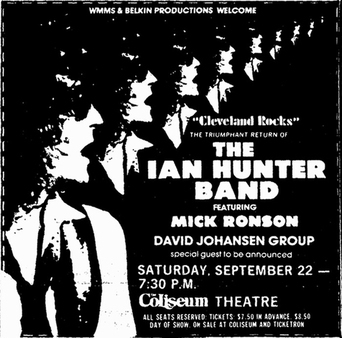 Ultimately I think the fans respected and appreciated anyone who gave them their “hard earned money's worth” and like Springsteen, David Johansen, Chrissie Hynde, and other favored sons and daughters, the Ian Hunter Band always put on a hell of good live show. Anyway, to show his appreciation, Hunter's 1979 release You're Never Alone With a Schizophrenic featured a tribute to the city he loved and the fans that loved him. Later the song would be re-worked into the theme song for the Drew Carey Show which was set in Cleveland. 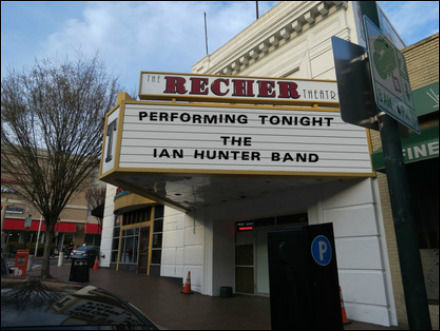 A few years ago I had the chance to see Ian Hunter perform at the Recher Theatre up in Towson. He had an extremely tight band behind him and the show was entertaining from start to finish. As the night progressed I started wondering: A) would he play the song, and B) would he change the lyrics because he wasn't in Cleveland. I soon had my answers: yes… and… no. After the show my friend Tom and I got to meet the man himself and I had to ask how he got away with it all those years—performing an anthemic rock n' roll tribute to Cleveland in places like Pittsburgh and Chicago and New York. He just laughed and said he had written the song for, and about Cleveland, and he wasn't about to tailor the lyrics every where he went. The Happy Medium Song of the Day is “Cleveland Rocks” by Ian Hunter. Whether the city still rocks or not, I can't say, but I know that when I was a teenager growing up there in the 70's, this song rocked and it made me feel like I was part of something bigger.